Most of the variation in the thyroid gland is the pyramidal lobe, which generally arises from the isthmus and lies in the midline, but can also arise from either lobe. It more commonly originates from the left lobe than the right lobe. Thyroid tissue can develop in abnormal locations (Ectopic or accessory thyroid), such as the tongue (lingual thyroid). The entire gland or part of it may descend downward more, and this results in thyroid tissue being located behind the chest bone or between the aorta and pulmonary trunk. It can also develop rarely within the trachea, and if present it may be life threatening. The two lateral lobes are almost equal, but occasionally they are very unequal in size, and in rare cases one lobe may be absent or the total thyroid may be absent (Athyrosis). The isthmus varies greatly in size and is frequently absent. Absence of the thyroid isthmus. Lateral lobes have pyramidal lobes. Pyramidal lobe arising from the isthmus of the gland. Accessory thyroid gland on the cricothyroid muscle. Pyramidal lobe on left, inferior part of the isthmus. Pyramidal lobe arising from the union of the left lobe at the isthmus. Accessory thyroids may be located under and above the hyoid bone. Persistent thyroglossal duct in an adult, originating at the foramen caecum of the tongue. 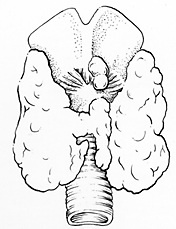 Thyroid gland with the pyramidal process attached to the left lobe, isthmus absent. Thyroid gland with both pyramidal process and isthmus absent. In the foetal life the thyroid gland originates in the back of the tongue and migrates to the front of the neck. If it fails to migrate properly, it can remain high in the neck or even in the back of the tongue. When migration fails and the gland remains in the base of the tongue, it is called a lingual thyroid or ectopic lingual thyroid. Lingual thyroids are more common in females than in males. They are usually less than a centimetre in size but can reach more than 4 centimetres. 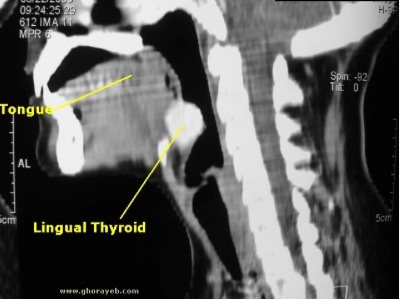 Large lingual thyroids can affect swallowing and breathing, but most people are unaware of it.